The world is full of truths; whoever believes to possess them, usually only flaunt them, while chasing them. Choose one, even if it seems erroneous to others; and do not choose with the many: because in what the multitude agree, that is the true error, or the erroneous truth. Therefore flee this, follow the other, and keep faithful to it: thus you will excel above others. I wrote in Halle of Magdeburg, on July 28, 1714. Michael Alberti was born on November 13, 1682 in Nürnberg, the son of the local pastor Paul Martin Alberti (1640-1705). He studied theology in Nürnberg and Altdorf, and later in Jena, where he also read medicine. He disputed in Halle under the chairmanship of Georg Ernst Stahl, and he graduated in medicine in 1704. He habilited privat-docent in medicine and philosophy, and in 1710 he became extraordinary professor. In 1716, as Stahl left the university of Halle, Alberti became his successor with his recommendation. From 1719 he was also a professor of physics. He kept his chair on the faculty of medicine until his death. He was a member of the Scientific Society of Berlin, and – with the name of Andronicus – of the Academia Leopoldina. He died on May 17, 1757 in Halle. He was a close friend and the most renowned follower of Stahl, and an enthusiastic upholder of the animistic theory as opposed to the mechanistic one. He was characterized by a general knowledge of medicine, as well as certain aesthetic and philosophic ideas. He also studied the legal aspects of medicine, and was one of the initiators of forensic medicine. He wrote a number of manuals, as well as hundreds of short occasional publications. Some of his works: Dissertatio medica, de hypochondriaco-hysterico malo. Praeses Georgius Ernestus Stahl. Halle, 1703. – Disputatio inauguralis medica de erroribus medicinae practicae. Praeses Georgius Ernestus Stahl. Halle, 1704. – Introductio in universam medicinam etc. Halle, 1715-26. 4 tom. – Systema jurisprudentiae medico-legalis. Leipzig, 1725-47. 6 tom. 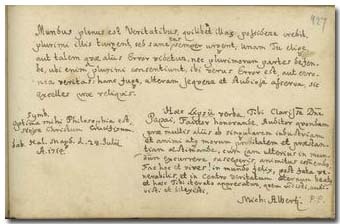 – Our Library preserves the dissertation of Goddofredus Moller defended under his chairmanship in 1730. Georg Ernst Stahl wrote in the album of Pápai Páriz six days before Alberti (p. 179).